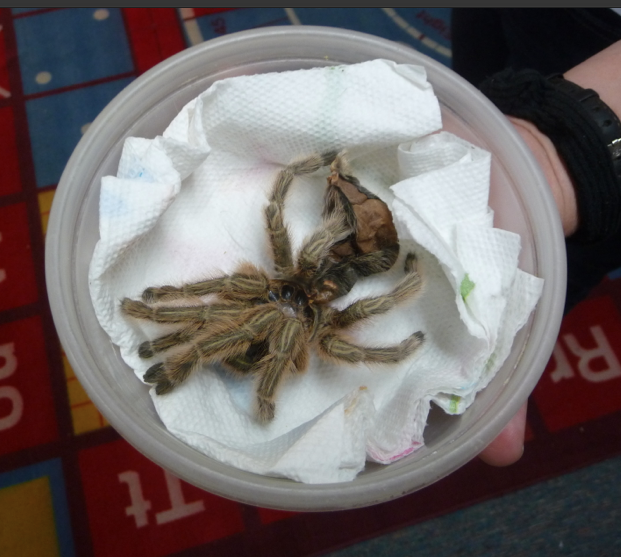 Mrs. Yollis' Classroom Blog: Meet a Tarantula and a Gopher Snake! 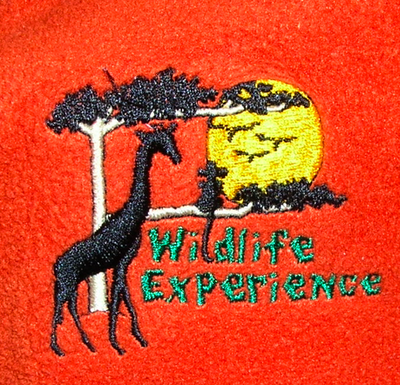 They are a non-profit wildlife education organization that brings native and exotic animals to schools and teaches children about the importance of our natural world. A spider is also called an arachnid (uh•rack•nid). An arachnid has two body parts, eight legs, and usually lives on land. Some arachnids are: scorpions, spiders, ticks, and mites. 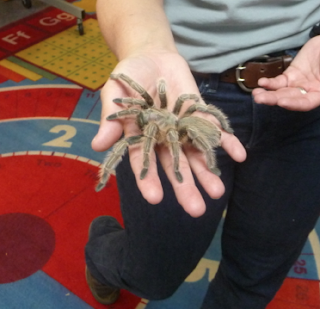 Here is a rose haired tarantula that can be found in South America all the way to Mexico. It has several adaptations. For one, the body is covered with hair that is pointy and jagged. If a predator tries to eat the arachnid, the hairs come off in the predator's mouth. While the predator is busy trying to get rid of the hairs, the spider crawls away. 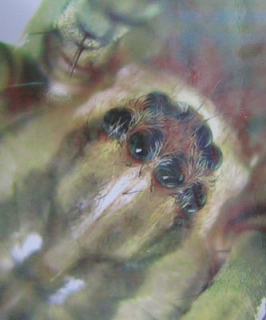 It also has spinnerets at the back of its body. It used them to make spider webs! A tarantula has eight eyes since it can't move its head to see in all directions. Miss C. walked around with room with Ocho, and we took a close look. Why is this tarantula named Ocho? This is a shedding of the rose haired tarantula. As you can see, it looks exactly like a rose tarantula, but it is hollow and all skin! 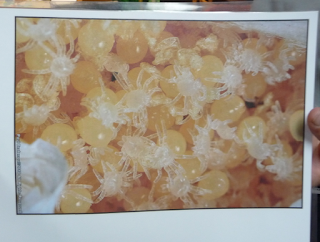 Here is a picture of a picture that shows baby spiders. :-) They are called spiderlings. 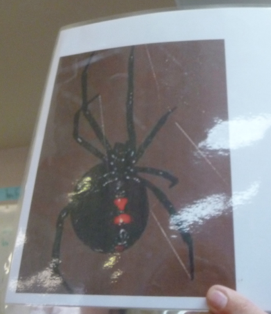 Here is a picture of a picture of a female black widow spider. The female black widow has a red pattern on her belly that looks like an hourglass. It is a warning that it is poisonous! The male black widow makes a delicious meal for the female. That's right, she eats him! This is a brown recluse spider which can be found in our area. It contains a lot of poisonous venom, more that the black widow! 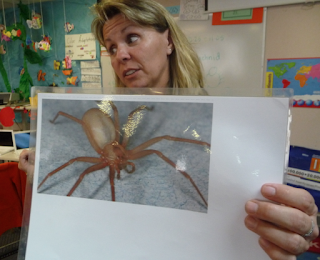 Miss C. told us a story about a teacher who had captured a brown recluse for an animal that eats spiders. It was the only time that Miss C ever saw a brown recluse in the wild. Miss C. also brought a beautiful snake. Students got to touch the scales of the gopher snake with two fingers. The coloration of the snake helps it blend in with its surroundings. That type of coloration is call camouflage. The gopher snake can mimic the rattlesnake's rattle by shaking its tail in dried leaves. 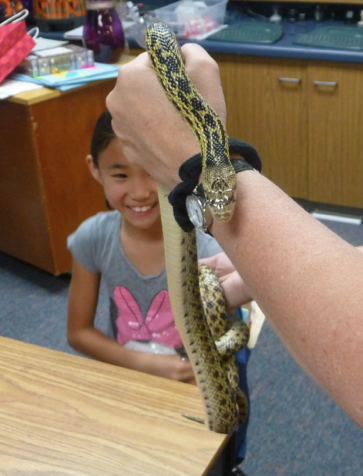 Predators think this gopher snake is a rattler and move away rapidly. 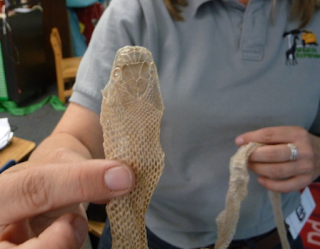 This is a photo of the gopher snakes shed, or molt. Notice the snake even shed the skin over its eyes. Miss C. called those eye caps. Snake do not have eyelids. This is the shed of a red tailed boa. This exotic snake is now 10 feet long, but will grow to be approximately 18 feet as an adult. This boa is so heavy that the law requires that two handlers when showing it to students. What arachnids or reptiles have you seen in the wild? Do you know any other animals that molt? Research some additional facts and share! 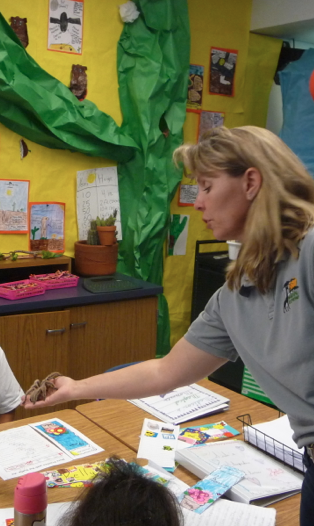 I think this is a spectacular way to see and learn about animals. I saw a gopher snake while I was hiking. My dog, Oliver, started chasing it! 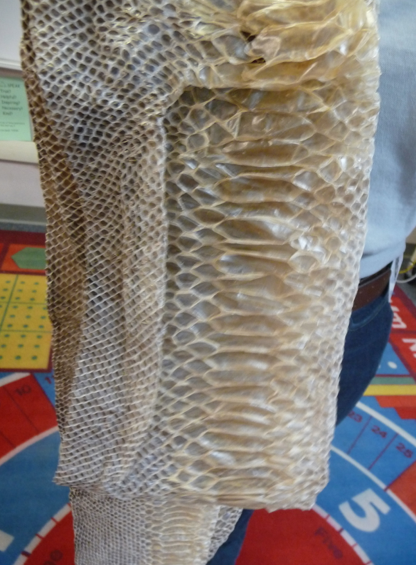 I've seen other snake skins at exhibits , but not in the wild. I've heard of the word arachnid, but didn't know what it meant until now. I was kind of shocked when Beverly said tics were arachnids! I also think this is a unique (you•neek) way to learn about animals. I have had many assemblies about animals in preschool, but they always showed us all the animals and then left. I like this new way where Beverly comes in five times with two animals in two weeks. My favorite part was when she showed us the tarantula. I found the eight legs and the two body parts. Did you? I loved the animals that Mrs. C brought to share with us. They were so interesting! One time, I saw a snake slithering in my backyard. My parents called the fire department and they came and told us it was a gopher snake. 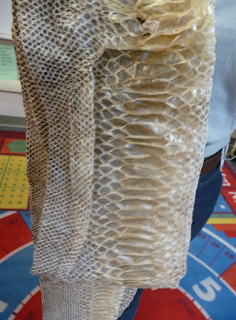 Just like the snake Mrs. C brought in. They even let me touch it and then they put it around my neck! After that, they put the snake over my backyard gate. Wow what an awesome why to learn about these animals. As for me I am not a lover of spiders/snakes and to get up so close and personal with that tarantula/snake I would have fainted. When I lived on a farm I did see a number of brown snakes. Brown snakes are very dangerous and are found sheltering amongst rocks. Also it is a know fact brown snakes sometimes burrows it self into holes of other animals. Thank you for sharing this up and close post!